We are pleased to offer a high quality wine & whisky glass hire service for all types of special occasions and tastings, including but not limited to; wine tastings, birthdays, corporate events and functions. Hiring the finest glassware ensures the wines taste great on the day, making the event both memorable and a success. Our range of different glass types available for general hire include red and white wine glasses, water glasses and champagne flutes. For more specialised events we are able to offer the Glencairn Official Whisky Glass and ISO style wine tasting glasses. Glass hire is made simple and stress free with Wineware. If you would like more information then please see our competitive prices below. Download and print off the (PDF) glass hire price list here. See our step-by-step guide on our glass hire service. We deliver the Wine Tasting Glasses & Whisky Tasting Glasses all over the UK. 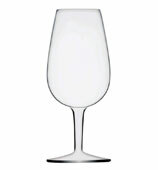 This 21.5cl wine tasting glass is the generally recognised standard size for wine tasting courses. These are the ideal glass for all types of Wine Tastings, Wine Courses and Events and are suitable for red, white, champagne and sparkling wines as well as fortified wines – definitely the ideal tasting glass. If you see any images of whisky tastings in any publication you will be certain to spot the Glencairn Official Whisky Glass. This is the recognised glass for all whisky tastings and has been for many years, especially after winning the Queens Award for Innovation in 2006. 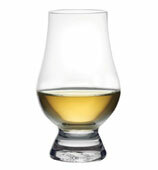 If you are holding a whisky tasting then you can’t go wrong by using this glass. For quantities over 264 (7 Trays), please call Wineware for a quote (01903 786148). Portrayed as glasses with character – the Schott Zwiesel Mondial range has elegantly curved bowls which flow harmoniously into the stems. The elegant and distinctive silhouette makes the Mondial range unique. These glasses are ONLY available for collection & delivery arranged by the customer. The Schott Zwiesel Vina range are capable of enhancing the presentation, aroma and flavour of the widest possible range of wines. These pleasing designs bring order to any table setting and mean they are suitable for everyday use and wine appreciation. The elegance and finesse of these glasses will definitely improve any event or wine tasting experience. Wine Spittoons are an essential part for any wine tasting or event. Wineware's range of different spittoons allow you to choose whether you wish to place spittoons per table / area or maybe each individual has their own spittoon which they carry round the tasting. 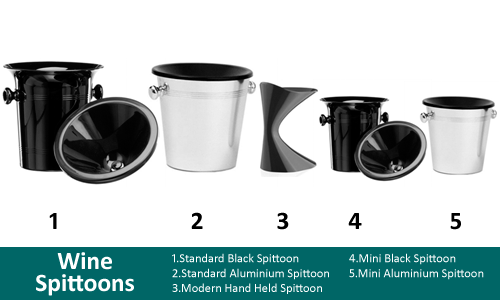 The standard and mini spittoons are available in either black plastic or aluminium and the modern hand held tasting spittoon is available in black plastic. Glassware hire gives you one less thing to worry about and you can focus solely on the event. All the glasses we provide are fully washed and polished and are ready to be used straight away. Simply remove them from their carrying boxes and place on the table ready for the first wine of the day. Once the event has concluded, all we ask is that you empty the glasses so they are as liquid free as they can be and place them back in their boxes. No need for washing as we take care of that upon their return. Very quick and easy with no worries – exactly as you no doubt need! For more information, please call us on 01903 786148 or email info@wineware.co.uk. "Lynsey and the rest of the team at Wineware provided us with a speedy, efficient and competitively priced way to hire top-quality glassware. I would recommend giving them a try as the beautiful wine glasses really did add to the ‘wow’ factor for our special celebration." "Having the Glencairn nosing glasses has made all the difference to tastings at Chichester’s Whisky Women club. The bowl of the glass allows members to warm the whisky in their hands and the tulip shape of the top concentrates the aromas allowing the maximum to be revealed from each whisky before it is actually tasted. Then the length of the glass actually encourages quite small sips: whisky should never be hurried! The glasses from Wineware are always immaculate: splendidly sparkling, never any damage, well packaged and the service is always efficient and friendly. I keep thinking I should buy glasses, but this hire service beats me doing the washing up!" 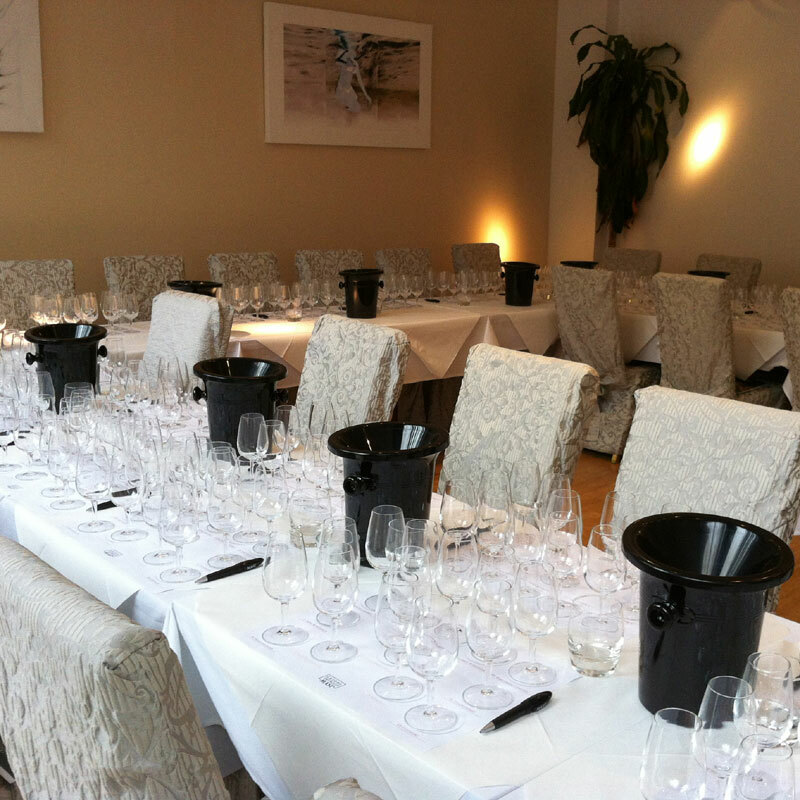 "We’ve used Wineware’s ISO glasses on numerous occasions for our external tasting events and really can’t fault them. They’re the perfect size for wine tasting samples and are of a really high quality. The service from Wineware is, as always, excellent and they arrive in A1 condition with no polishing required. The ability to return them unwashed after a busy event is an absolute joy and a real timesaver. We’ll definitely continue to utilise these brilliant glasses for our tasting events." If you’re interested in hiring glass from Wineware for your event, then the easiest thing to do is either email us on info@wineware.co.uk with the words ‘Glass Hire Request’ in the subject line or simply phone us on 01903 786148. We will do our best to fulfil your needs, we are very easy to work with and try our utmost to help and make sure that the glass hire is the least of your worries. The prices shown on the Glass Hire page are excluding VAT and we do ask for a deposit of 50% of the total hire charge, including delivery, when your order is confirmed. As with most things, the more notice you can give us regarding the date & location of your event, then the easier it is for everyone. Your order can be cancelled at any stage but charges will apply if this is within a certain timescale of the event. If the hire is cancelled within 10 days of the event then no charges will apply, however if the cancellation is received within 5 days of the event a charge of 35% of the total hire cost will be required and this will rise to 100% if the cancellation is made within 48 hours of the event taking place.